where pedestrians are allowed to use the whole street but are not allowed to intentionally impede vehicle traffic. 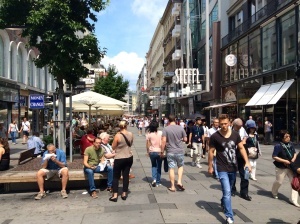 Due to the ongoing success of Mariahilferstraße, Austria’s premier shopping street, accompanied by significant increases in pedestrian volumes (up from 25,000 to 70,000 per day) since 1996 (due to longer opening hours, a more attractive retail offer and more people coming by foot, bike and public transport), the two adjoining districts decided to redesign the street and transform it into a pedestrian zone and Vienna’s first “Begegnungszone” (shared space) within a $US31m overall budget. The transformation was accompanied by a large-scale information campaign and opportunities for civic engagement through a dedicated website, newsletter, expert round table discussions, resident surveys, feedback boxes and finally – after a fiercely debated trial (interim redesign) period – decided by a public referendum among the 48,642 residents of the two adjoining districts which brought a narrow 53.2% approval rate at a unusually high participation rate of 68.1%. 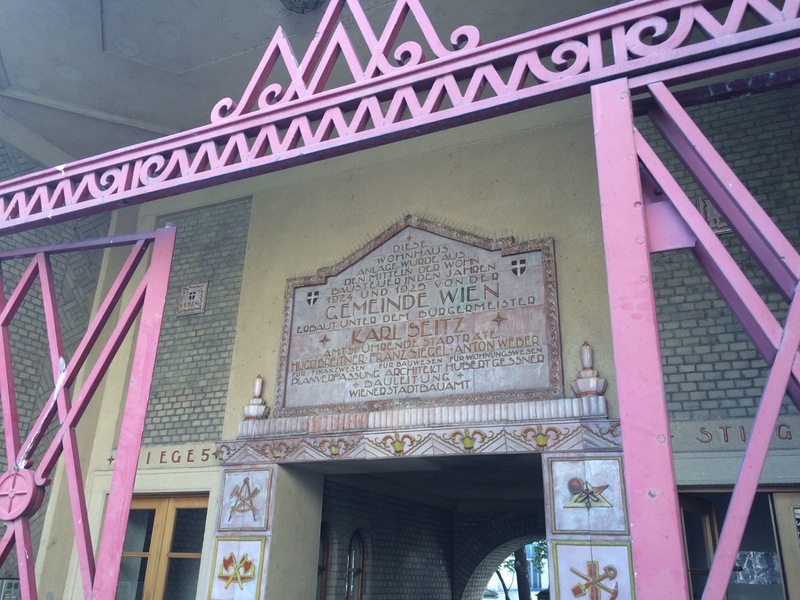 Construction began in May 2014 immediately after the positive outcome of the referendum and was completed in November 2014. A second phase of construction is to take place from February to July 2015. 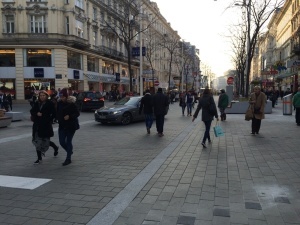 As the first construction phase delivering the first shared space and pedestrian zone was recently completed in November 2014, there is to date no quantitative evaluation on increases in pedestrian volumes and other factors. Moreover, such studies would only have limited significance in December due to the closure of the whole street to cars and bikes on the four Christmas shopping weekends each year. There are also no other quantitative studies on shared spaces in Vienna as Mariahilferstraße is the first shared space to be implemented but there is a long tradition of successful pedestrian streets since the 1960s with almost 100 pedestrian streets in Vienna today. 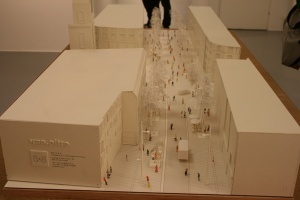 However, based on qualitative observations during the trial period and after the first construction phase, it can be seen how the street already acts as a catalyst for urban transformation with pedestrians now walking in the middle of the street and claiming more space once the differences in surfaces and surface levels were removed. 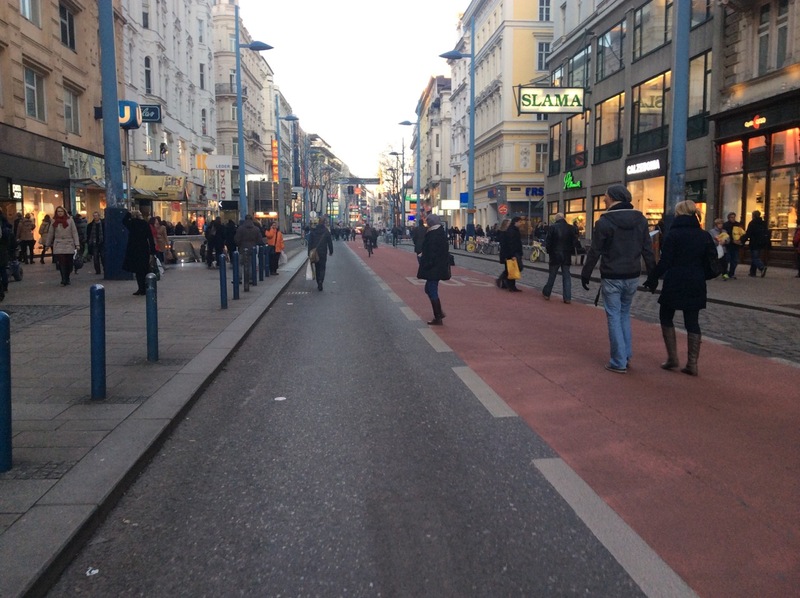 As Mariahilferstraße allows us to directly compare a shared space and pedestrian zone approach, it can also be observed that this effect is noticeably more predominant in the pedestrian zone than in the shared space zone where cars are present. 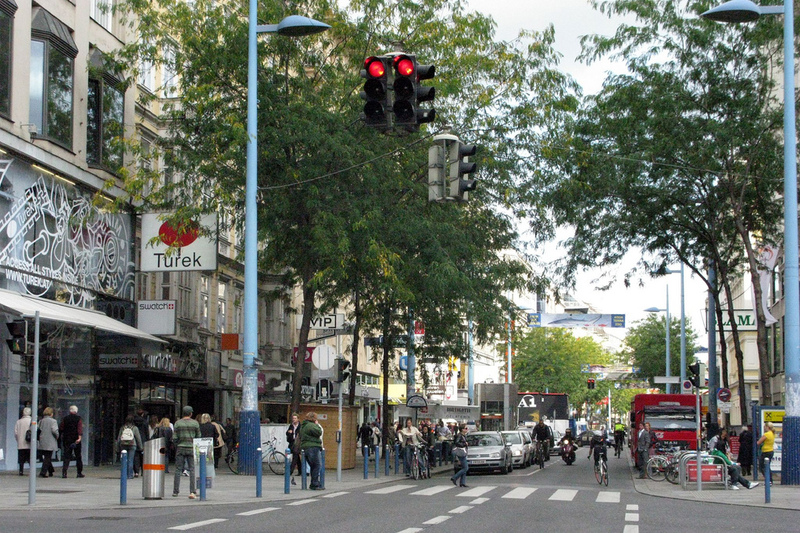 The redesign of Mariahilferstraße shows how a street for cars where pedestrians are pushed at the edges, with narrow, crowded sidewalks and long waiting times at traffic signals can be transformed into a street for people with higher priority for pedestrians and cyclists. 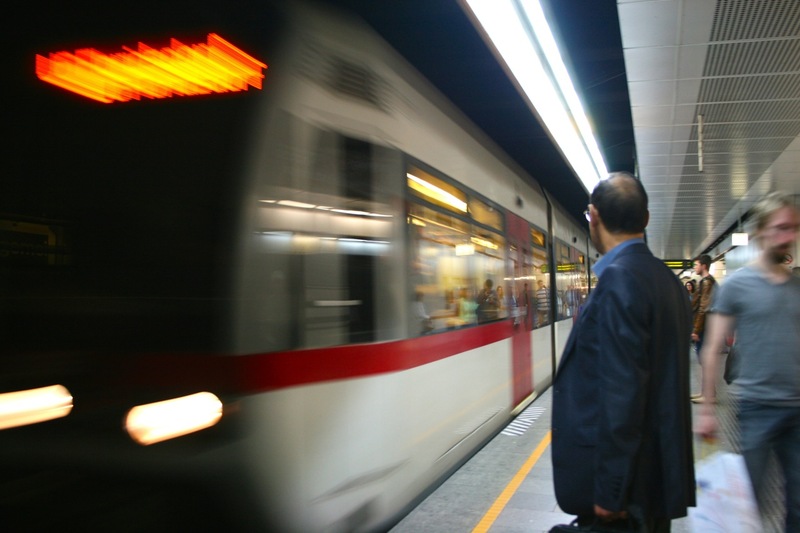 The equal treatment of all traffic modes, the integration of bikeshare stations and the availability of subway and tram connections show the emphasis on accessibility and quality, multi-modality and interconnections as integral parts of a sustainable transportation approach. 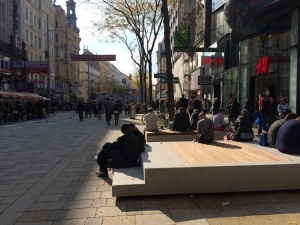 Moreover, the availability of more places for pedestrians to sit down, observe, communicate, play, and so forth adds to the argument that life in public spaces is a key urban attraction and that “the sight of people attracts still other people”, thereby strengthening the role of the street as a “major point of transaction and communication”. In this regard, the removal of on street parking to create this space was fundamental to creating this higher prioritisation of people. 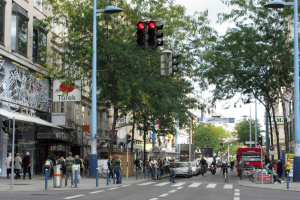 The equal treatment of all traffic modes, the lower speed limit, the removal of traffic signs and traffic lights, the levelling of the street and the addition of street furniture and other objects contributes to traffic calming and therefore to increased pedestrian safety (especially when crossing the street), less noise and less pollution, thereby increasing the quality of life for both residents and visitors to the street. 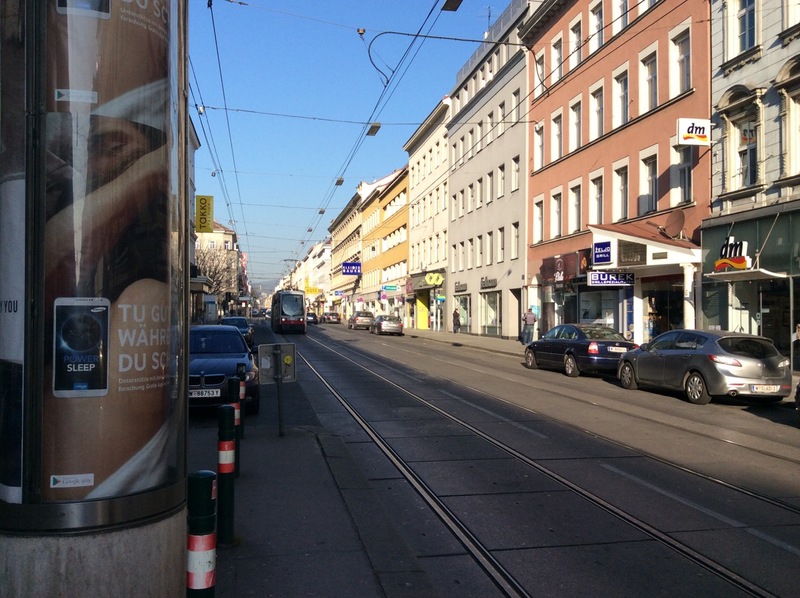 In fact, the traffic speed of 20 km/h is lower than Mariahilferstraße’s previous speed limit of 30 km/h and the general speed limits on Vienna’s streets of 30 km/h or 50 km/h (on higher-order streets). In particular, the better street design also results in wider footpaths and more space in front of shops as chairs and tables of cafés and restaurants move to the centre of the street, thereby also creating space for sitting and standing at the street’s edge zones. 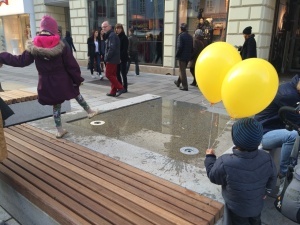 Street furniture and other elements include four water tables, five seating lounges, 24 new tree pits, 82 new seating opportunities and 111 new street lights with infrastructure for free public WiFi that should also encourage people to linger. In addition, a barrier-free ground-level design and an integrated guidance system for the blind further improves safety and comfort for a particularly vulnerable population group. Finally, due to the removal of traffic signals, average vehicle travel time should not increase significantly. According to studies from other cities, pedestrians and cyclists usually spend more money locally than car drivers. 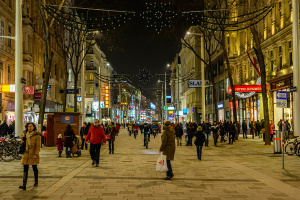 With the redesign of the street, it also becomes easier for them to switch from one side of the street to the other, thereby improving access to all shops on the street. The positive experiences from people sitting outside in the new commercial and public seating opportunities due to mild temperatures last November as well as first positive feedback from business owners suggest that the redesign will have overall positive economic impacts. 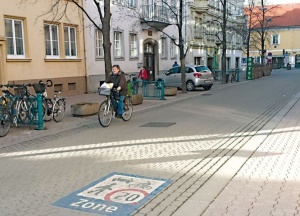 From an environmental and social point of view, the removal of on street parking and restriction of, and reduced prioritisation of, car access also contributes to getting more people out walking, cycling and taking public transport, thereby lowering greenhouse gas emissions. 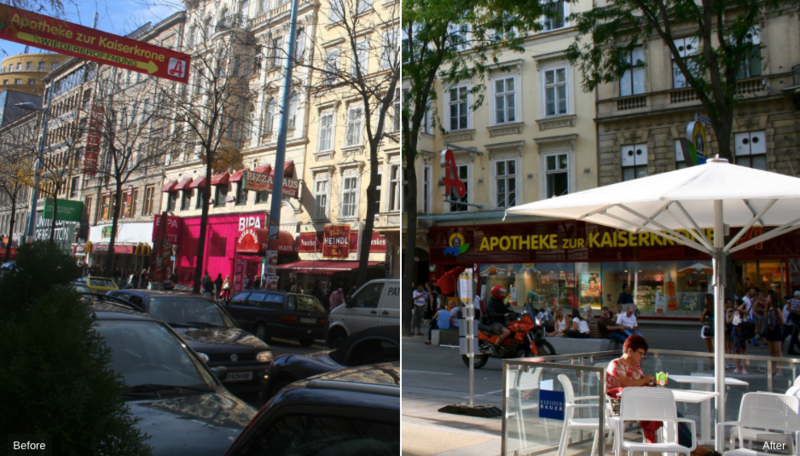 In addition, as Mariahilferstraße’s two adjoining districts previously lacked quality public space, the transformation serving as a positive example for the role of streets as the most vital yet underutilized public spaces in cities. The City of Vienna started a broad public dialogue in November 2011, three years before the opening of the transformed street. This included public information (including renderings and physical models as methods for visualising the redesign), round tables, surveys, feedback on the trial period, an exhibition and finally the aforementioned referendum. 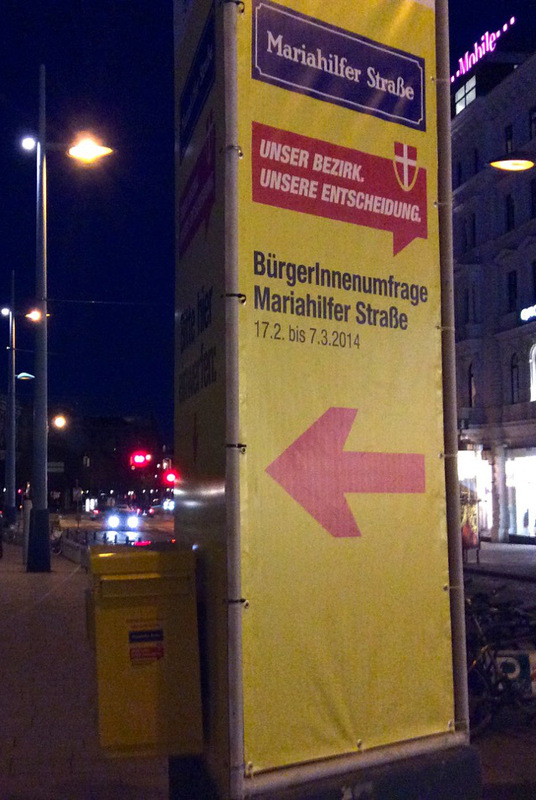 Given the narrow result of the referendum, the fierce debates – including strong resistance from some business groups, media and political parties and the general resistance of Viennese people to change – it was clear that such an extensive public engagement strategy was crucial to enable this street redesign to happen. So, it isn’t surprising that the City of Vienna’s approach to shared spaces must always include extensive public engagement and outreach. 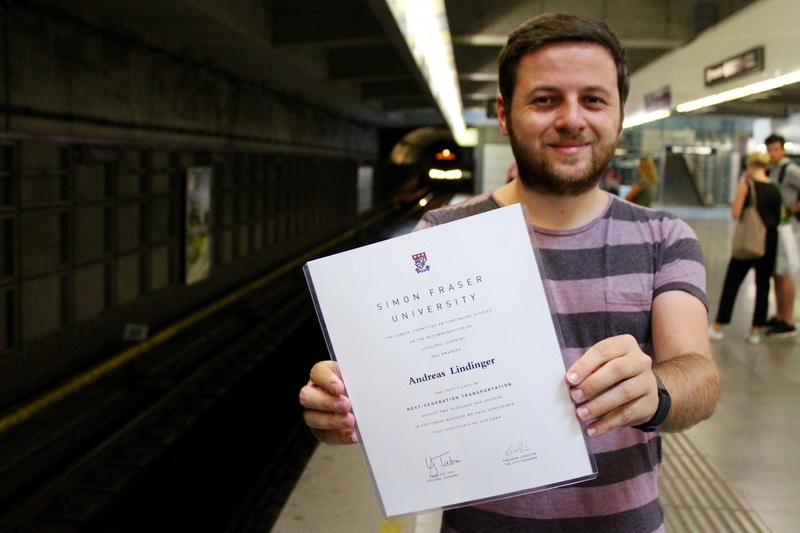 Compared to similar international regulations (e.g. Switzerland, Belgium, France), the Austrian legislative framework for shared spaces is different in the sense that there is no absolute priority for pedestrians but instead equal treatment of all road users. Combined with the fact that pedestrians are not allowed to intentionally impede vehicles and the legal possibility of increasing the speed limit to 30 km/h, this makes it more difficult and confusing for pedestrians to cross the street in a secure and comfortable way. 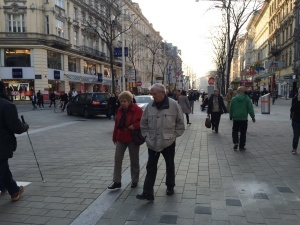 Moreover, too many surface markings can also discourage pedestrians from actively using the shared space. 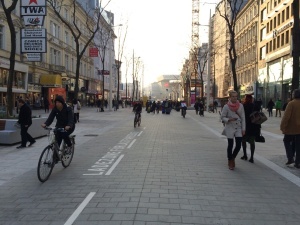 Shared space, pedestrian zone or a combination of both approaches? 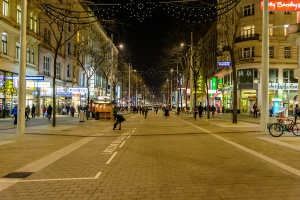 The comparison of the street’s pedestrian zone and shared space raises the question of whether a fully pedestrianised street would have been the better outcome. This is in line with observations that the behaviour patterns of pedestrians on streets with limited traffic are much closer to those from traffic streets than from areas that were totally free of cars. 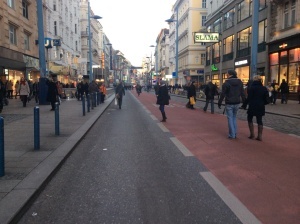 On the other hand, pedestrians’ hesitation in using the whole street in the shared space might also stem from the fact that Viennese people are more used to pedestrian zones than to shared spaces. 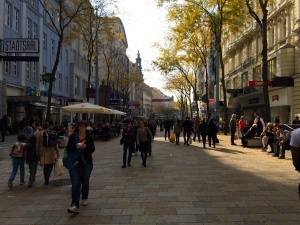 While, according to its new Mobility Plan, the City of Vienna aims at establishing a “new mobility culture where pedestrians, cyclists, public transport users and drivers encounter with appreciation and attention” through the creation of new shared spaces and (temporary) pedestrian zones, the City has no overall strategy nor executive power to transform streets into shared spaces as this can only be decided by the respective districts (but needs approval from the City’s traffic department). While the City states that it wants to transform one major street per district by 2025, this will only be possible if districts (sometimes with different political leadership) cooperate and are willing to spend money. Similarly, there is also no legal possibility for citizens, neighbourhood associations, etc. 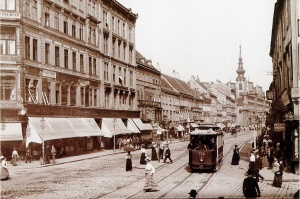 to propose shared spaces to their district or to the City of Vienna. 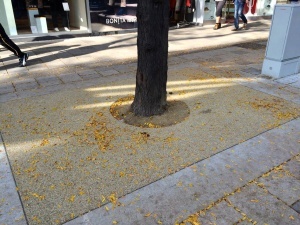 While the street’s redesign includes new street furniture and other elements which are essential for traffic calming and the quality of lingering in the street, there has been a considerable criticism of the materials used, such as them being uncomfortable and easily getting dirty. The limited colour palette (which will hopefully improve in spring/summer) as well as the limited use of water elements and green spaces are other issues. If these issues were addressed, it would encourage people to stay longer in the space. 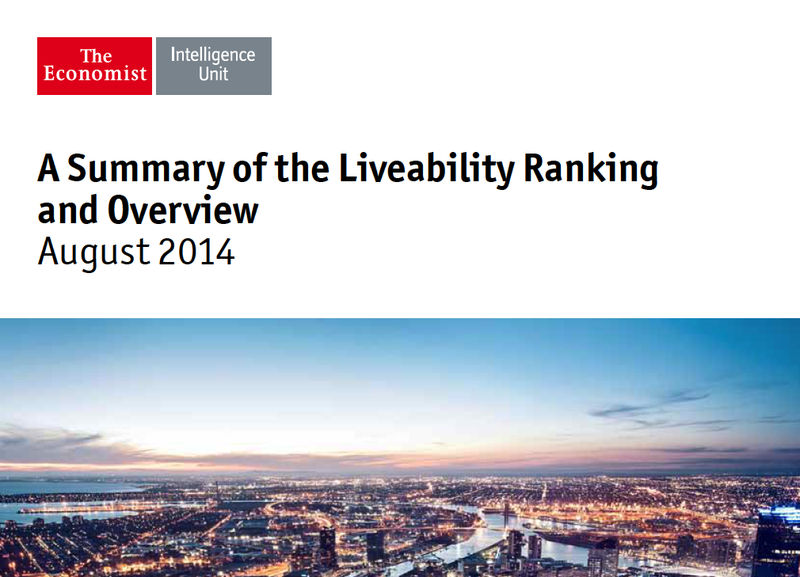 In addition, the absence of sufficient bike parking decreases accessibility and modal choice. 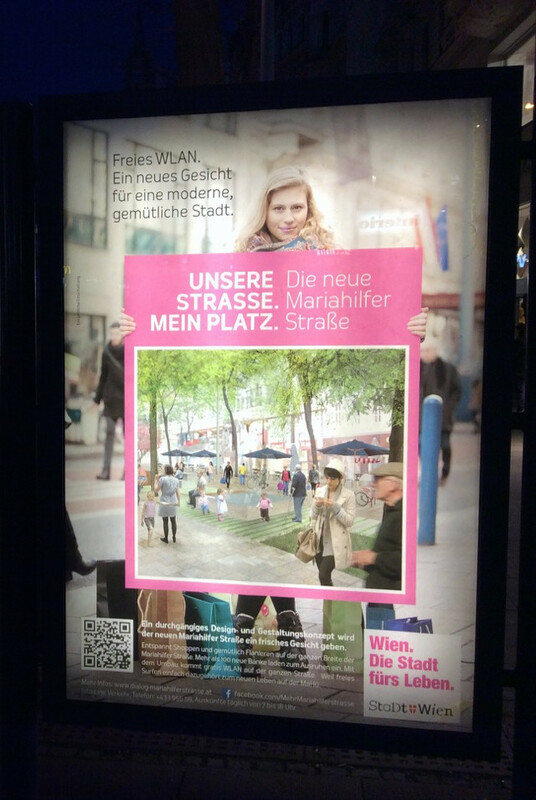 While the referendum on Mariahilferstraße’s redesign only passed by a narrow margin, it can be assumed that the redesign has a much higher approval rate now that it has been implemented given the positive feedback from citizens, shop owners and media. 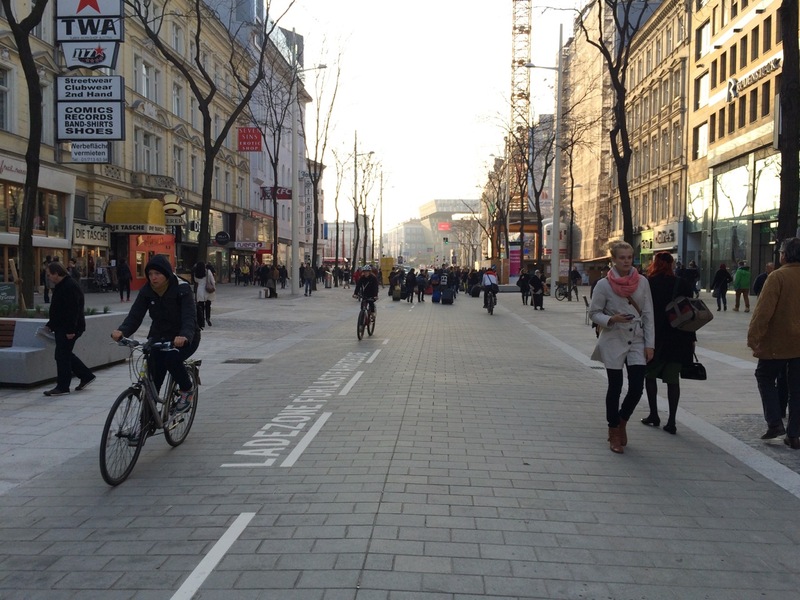 However, there is still room for improvement, especially as this is Vienna’s first “Begegnungszone” (shared space). 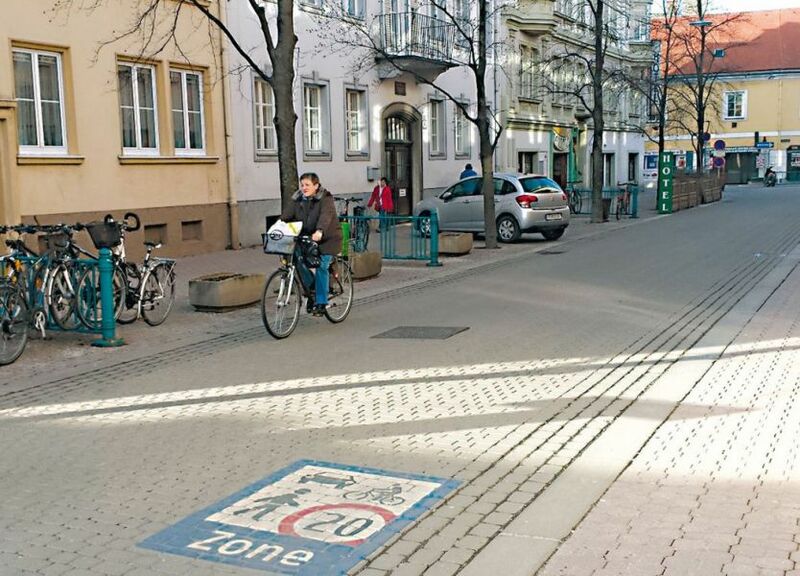 (1) Pedestrian priority: Give pedestrians a higher priority than other modes in the legal framework, allow a lower (instead of a higher) speed limit of 10 km/h and reduce surface markings and other elements that discourage pedestrians’ street use. 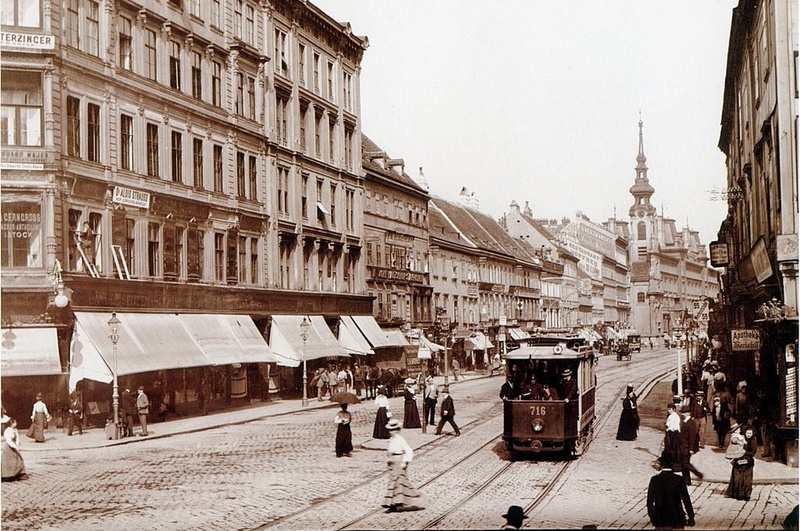 (2) Clear roadmap and easier implementation: The City of Vienna should develop a clear, overall strategy (roadmap) for the identification and transformation of streets and think about transferring executive power from the districts to the City to foster a coherent, city-wide approach. 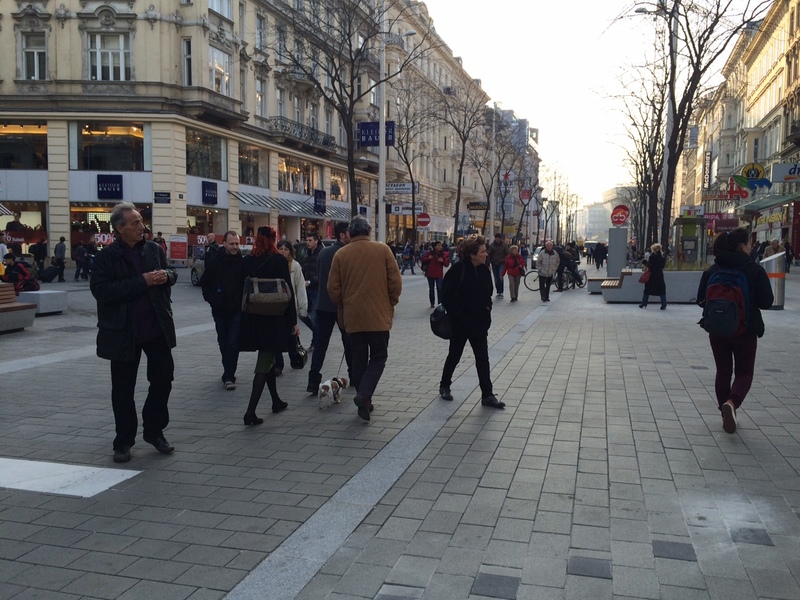 Moreover, it should be easier for residents and citizen groups to suggest streets to be transformed into shared spaces. 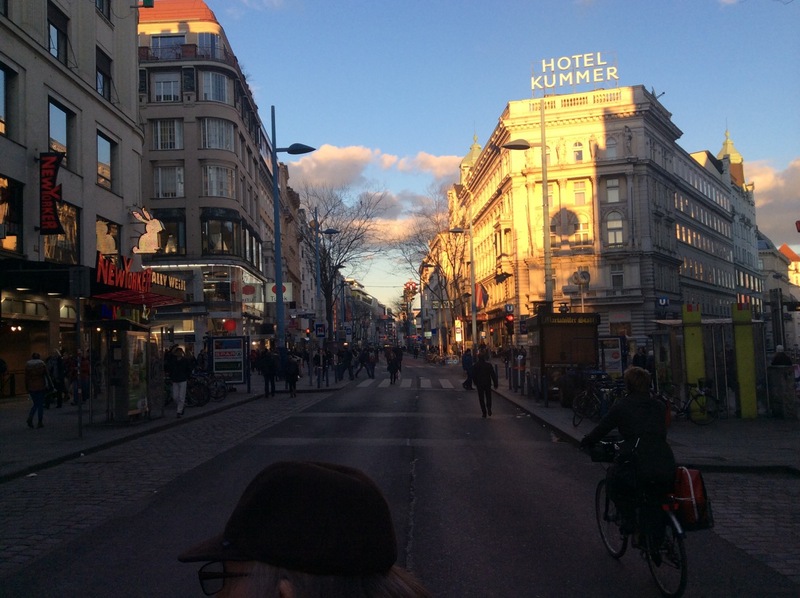 (3) Mix of different approaches: After the ambitious redesign of Mariahilferstraße, it will be crucial to show that shared spaces are a viable solution for both smaller streets and further large projects. 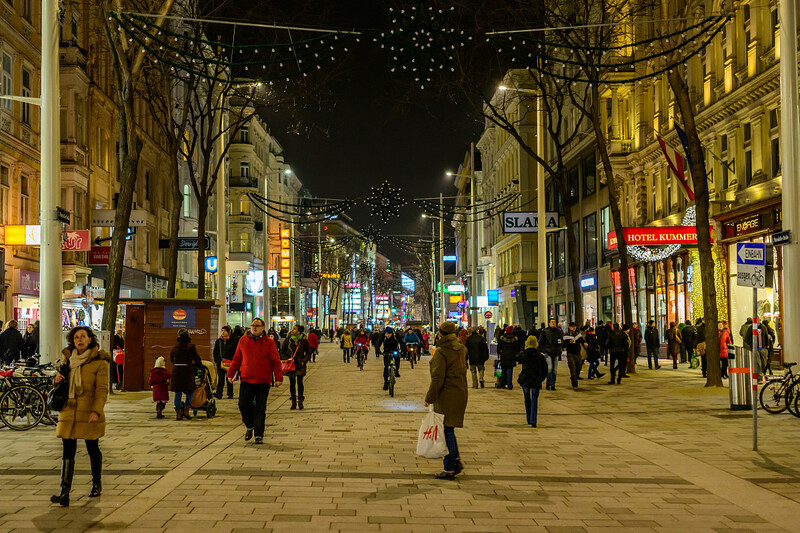 However, as there are no “one size fits all” solutions, every proposal has to be evaluated on a case by case basis to see if a street redesign makes sense or if a shared space or pedestrian zone approach makes more sense. 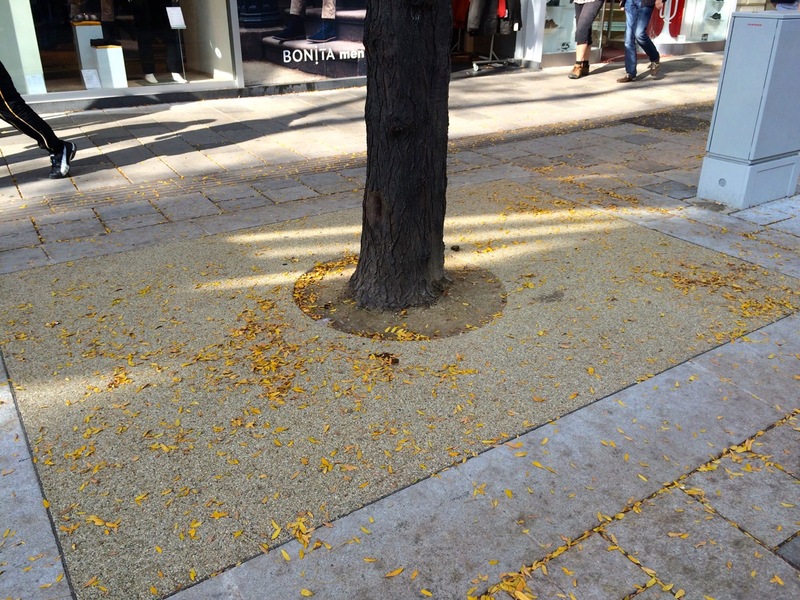 Moreover, while a temporary trial period helps in visualising and anticipating the proposed changes, it could be improved through the increased and better use of colours and street furniture. (4) Better street design: More creative, diverse, colourful and courageous design of street furniture and other objects as well as more use of water and green elements would further improve the quality of public space within the shared space. Moreover, it has to be evaluated how many and which objects, surface markings and other elements are best employed to create a good environment for all traffic modes, most particularly pedestrians. 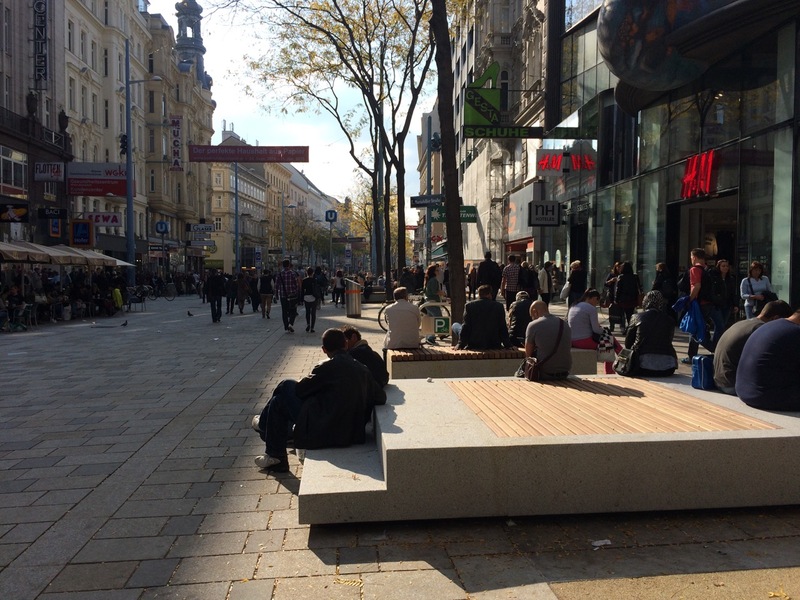 (5) Integral public engagement: Vienna’s experience clearly shows that – despite the challenges of to several group’s resistance – a thorough public engagement process is vital for the success and acceptance of such a street redesign. 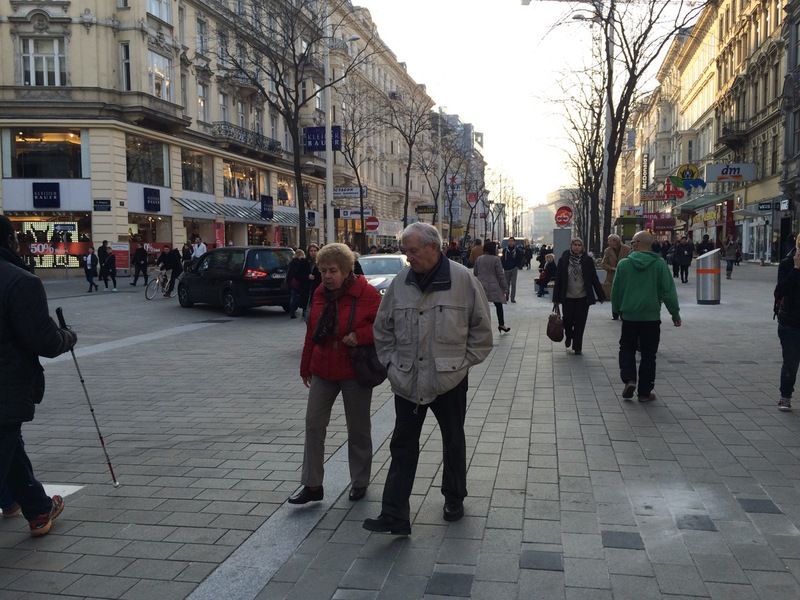 This public debate might be easier when it comes to transforming smaller, less prominent streets.